St. Patrick’s Day may be March 17, but if you’re still feeling the rub of the green after the holiday weekend, Silks Poker Room at Tampa Bay Downs has the perfect way for you to cash in on your good fortune! Enter the Annual St. Patrick's Day Tournament at Silks from March 21-24 and you can win your share of Silks' pot of gold, filled with a guaranteed $50,000 in prize money. From March 1-10, the highest hand in Level 2 of any daytime tournament wins you a seat in the St. Patrick’s Tournament. From March 11-20, the highest hand in Level 2 of any nighttime tournament wins you a seat. Any royal flush between March 1-20 wins you a seat. A series of satellites can get you into the St. Patrick's Tournament for as little as $30. Step 1 satellites will be held at 7:00 p.m. on March 14 and March 18. The last 20% of the field in each satellite advance to the Step 2 satellite at noon on March 21. (You can also buy into the Step 2 satellite for $85.) The last 20% of the field in the Step 2 satellite wins seats in the St. Patrick's Tournament. From March 1-20, the highest hand in Level 3 of any tournament wins you a seat in the Step 2 satellite. If you make to the end of any of the Day 1 sessions, you advance to Day 2 on Sunday, March 24. From there, the remaining players continue on until one person has all the chips and takes home the big prize! 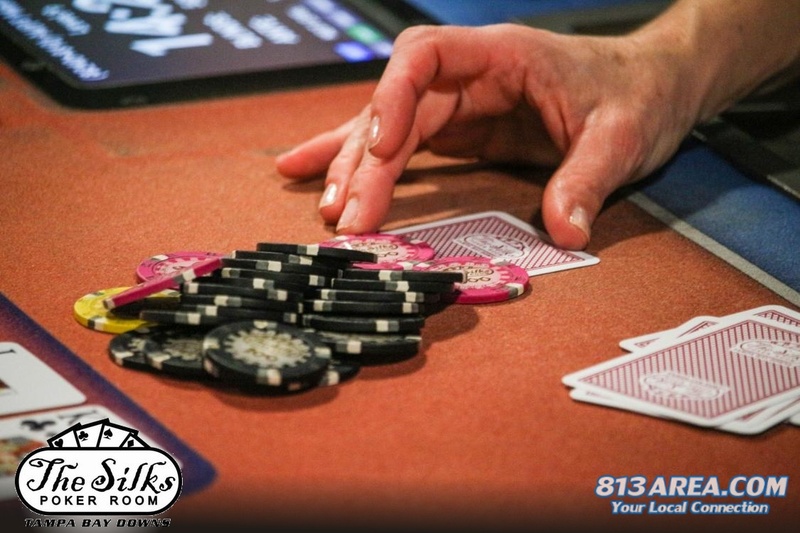 As always, Silks Poker Room has the best card games in Tampa! Enter daily tournaments or join in no-limit Texas hold 'em cash games with buy-ins and blind levels for players of any ability. With racing in season at Tampa Bay Downs, you can also keep an eye on the action on the track with finish line views at almost every table. And if you're worried about missing the NCAA Tournament while you're playing in the St. Patrick's event... don't! There are TVs showing live sporting events all over Silks, and the Silks Bar and Grille lets you take a break with a complete food menu and drink specials. Come and enter the St. Patrick's Tournament from March 21-24 at Silks Poker Room. If you play your cards right and luck of the Irish stays with you, you'll walk away a big winner this month! The latest sports news and updates on events around Tampa can be found on 813area.com. Make sure to sign up for free email updates so you'll always know what's going on.